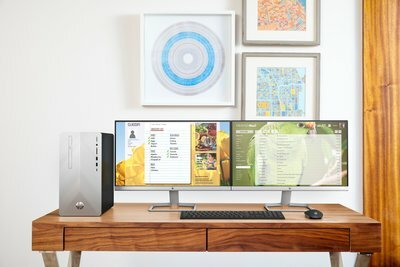 Enjoy all the Internet has to offer with this desktop computer, which features wireless technology and a massive 1TB hard drive. The various USB ports allow simple connection of peripherals, and the computer comes with a wireless keyboard. Powered by 8th Gen Intel Core i7+8700 processor. 8GB of memory is available. Powered by 8th Gen Intel Core i7+8700 processor. Get the speed you need. 8GB of memory is available. Ths memory is expandable up to 32GB (additional memory sold separately). Also includes 16GB of Intel Optane memory. Delivers faster, smoother, and amazingly responsive computing experience. 1TB (1000GB) hard drive stores songs, games and more. Features Wireless-AC (802.11ac) technology for cable-free networking. 3-in-1 media card reader supports SD, SDHC and SDXC formats. Use the HDMI™ port to view videos and photos on your HDTV (HDMI cable sold separately). Features 4 USB 3.1 ports for file sharing made easy. 4 USB 2.0 ports allow wired connection of peripherals. Bluetooth® wireless permits short-range wireless data transfers at up to 30' with other Bluetooth-enabled devices, such as phones, speakers and printers. Includes a wireless keyboard and optical mouse. All your activities become easier and faster than before with the latest Hexa-Core Intel® Core™ i7 processor and advanced Intel® UHD integrated graphics. Watch videos, edit photos, and connect to family and friends with all the power you need to get things done. Make a statement with a new slim design featuring a sleek profile that doesn’t compromise performance—all complemented with a bold, geometric pattern and brushed texture. Seamlessly boot up in seconds and save everything you love with all the storage and speed you need. 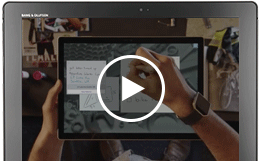 It’s never been easier to give your device a bigger or second display. With HDMI output you can transmit HD video and sound with just one standard cable. With all the necessary ports for true 5.1 surround sound, give your favorite movies, shows, or music more nuanced, immersive sound quality, just by hooking up a Surround Sound speaker setup. Enjoy all of your entertainment with this universal media player. Enhanced playback quality of DVDs, video files, and Blu-ray discs means a sharp picture, better lighting, and smooth motion. When you have a spotty wireless connection, you can quickly plug in your Ethernet cable to get a smooth, wired Internet experience that bypasses any wireless issue. The flash cache module is designed to accelerate the system response experience and cannot be used as additional storage capacity. It is not removable by and not accessible to the user. 1 For storage drives, TB = 1 trillion bytes. Actual formatted capacity is less. Up to 35GB of drive is reserved for system recovery software. 2 Intel® Optane™ Memory for HP desktops and notebooks is cache memory that helps reduce boot times and load times and will not increase storage or system memory capacity. Requires a 7th Gen Intel® Core™ processor, bios version with Intel® Optane™ supported, Windows 10, version 1703, an Intel® 200 series chipset, M.2 type 2280-S1-B-M connector on a PCH Remapped PCIe Controller and Lanes in a x2 or x4 configuration with B-M keys that meet NVMe Spec 1.1 and Intel® Rapid Storage Technology (Intel® RST) 15.5 driver. 3 Multi-core is designed to improve performance of certain software products. Not all customers or software applications will necessarily benefit from use of this technology. Performance and clock frequency will vary depending on application workload and your hardware and software configurations. Intel’s numbering is not a measurement of higher performance. Intel, Pentium, Intel Core, Celeron, Intel logo and the Intel Inside logo are trademarks of Intel Corporation in the U.S. and other countries. 4 Part of the total system memory (RAM) is used for graphics/video performance. System memory dedicated to graphics/video performance is not available for other use by other programs. 5 Actual speeds may vary. 6 Wireless access point and Internet service required. Availability of public wireless access points limited. The specifications for the 802.11ac WLAN are draft specifications and are not final. If the final specifications differ from the draft specifications, it may affect the ability of the notebook to communicate with other 802.11ac WLAN devices. 7 Bluetooth® is a trademark owned by its proprietor and used by HP Inc. under license. 8 ENERGY STAR and the ENERGY STAR mark are registered trademarks owned by the U.S. Environmental Protection Agency. 9 EPEAT® Silver registered where applicable. EPEAT registration varies by country. See www.epeat.net for registration status by country. 10 Call 1.800.474.6836 or www.support.hp.com for more information on Care Packs available after 90 days. After 90 days, an incident fee may apply. 11 Service levels and response times for HP Care Pack Services may vary depending on geographic location. Service starts from date of hardware purchase. Restrictions and limitations apply. HP Care Packs are sold separately. See www.hp.com/go/carepack-services for details. 12 HP SmartFriend will support any major brand of computer and tablet running Windows, OSX, iOS, Android, and Chrome OS. 24 x 7 phone support is available in the US only. Service availability varies by country/region. Internet connection required for remote support. HP SmartFriend sold separately or as an add-on feature. 13 Internet access required and not included.